Intense droughts, population growth, lack of sustainable land and water management practices and conflicts have led to massive population displacements across Africa, a United Nations Environment Programme report says. More than half of the world’s fragile countries are located in sub-Saharan Africa. Some of these have the largest numbers of internally displaced persons. Africa has more countries affected by displacement than any other continent or region, and was home to more than 15 million internally displaced persons in 2015, a 2016 Global Report on Internal Displacement says. “…many African countries have high levels of vulnerability to drought (and to other natural hazards),” Mohamed Bazza, senior water resources officer, land and water division, FAO Rome, said in an interview to Down To Earth earlier. Displacement can have serious consequences, leading to environmental degradation. 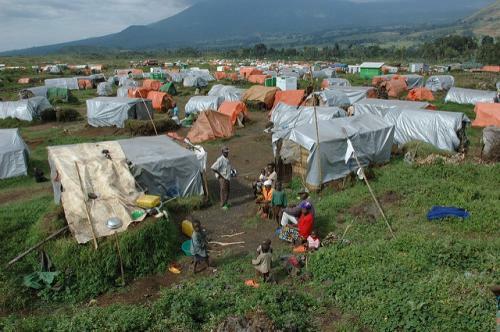 Rapid urbanisation and poorly managed refugee camps can put pressure on limited resources. The growing intensity of disasters due to climate change, coupled with the effects of environmental degradation, is likely to fuel human displacement further. The Horn of Africa and the Sahel region face high risk of climate change. With the effects of climate change, existing demographic pressures and reliance on agriculture, pastoralism and other natural resource–based livelihoods are expected to increase food and water insecurity in these two regions, the report adds. Sahel is a semi-arid region of western and north-central Africa, extending from Senegal to Sudan. The United Nations assessment of climate change impacts, produced by the Intergovernmental Panel on Climate Change (IPCC), shows that Africa will face increased risk from climate change. These include heat waves, rise in sea levels, floods and droughts, leading to crop failures, water shortage and diseases. Rainfall variability, land degradation and desertification are some of the factors that make life extremely difficult in this part of the world, the paper adds. Human displacement is not a new phenomenon but climate change is contributing to it. While climate change and environmental degradation set the stage for displacement, poverty often determine displacements, the report says. Ethiopia, a country located in the Horn of Africa, suffered one of its worst meteorological droughts for 50 years in 2015, following the failure of two consecutive rainy seasons. More than 80 per cent of the country’s agricultural yield and the employment of 85 per cent of the workforce depend on adequate rainfall. The drought contributed to the lowest soil moisture levels in at least 30 years, crop failure, below average vegetation cover and severe water shortages in pastoral and arable farming areas.